Sunny days have finally blessed us with their presence and that can only mean one thing- Time to break out the sunglasses. We love to switch a pair of sunglasses when the warm weather comes in. A trendy pair of an eye wear is an year round statement, and its only natural that we get the most out of them during the summers. With that in mind, its very rare that we get the best of maximum worlds , like a one stop destination where one could just log on, n walk away with their dream pair - Bingo. 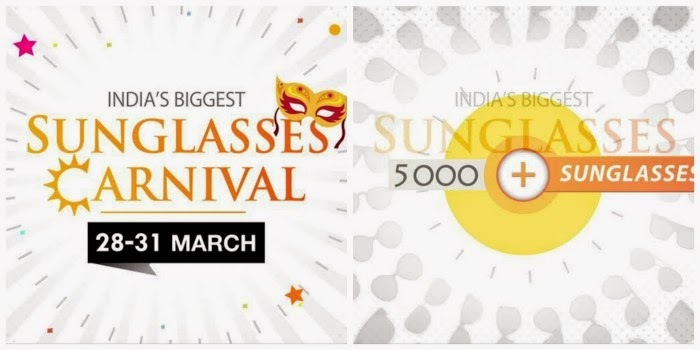 is starting the biggest online carnival starting 28th-31st March, and with that your most stylish and practical accessory would be available on a great bargain. If you are an avid reader of my blog, then I am getting the word out to you. Your favourite brand X Your favourite pair or model , start looking out well in advance, and try them to your best of ability virtually, so that when the time comes, you are the first few to get the deal. Who knows that this statement pair could just simply be your next big thing,and when it falls into the bargain category with price, and just one step ahead of your summer wardrobe to fall for a complete ? So what's your favourite pick ? With so many stylish frames on the website, how would you gals know which one is in trend these days ? So definitely you might need help into picking out the best pair for you, Nd here's what you should look out for to let the first step out after the spring break in the scorch. Have you tried the mirrored glasses trend ?